Die Idee ein Objekt von der Schwerkarft zu befreien wirkt faszinierend, verweist jedoch gleichzeitig auf enorme pysikalischen Beschränkungen. Der Schwebezustand ist eine immanente Frage der Skulptur. In dieser Arbeit hält ein Elektromagnet, welcher durch einen photomechanischen Sensor über einen Lichtstrahl gesteuert wird, das metalische Objekt im Schwebezustand. Beginnt das Objekt zu fallen, bekommt der Sensor mehr Licht, dadurch wird mehr Strom in den Elektromagneten gespeist, welches wiederum ein Anheben des Objektes zur Folge hat. Physikalische Parameter, die uns bestimmen (oben/unten/links/rechts) werden neu bestimmt. Die Objekte scheinen frei von Masse und Gewicht und lassen so ungewohnte und immaginative Aspekte von Körper im Raum erfahren. Sie nähern sich dem alten Traum der Avantgarde: die Befreiung der Skulptur vom Sockel. The idea of freeing an object from the action of gravity is rather disconcerting and at the same time confronts us with enormous limitations. The question of levitation is fascinating not only because of the unique condition of a body floating in the air, but mainly because of the absence of any type of visual support maintaining the object in space. Levitation is something that presents itself as an inherent question for sculpture: it offers new directions for the classic problem of support. 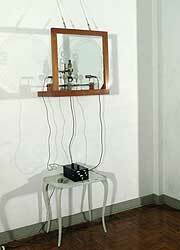 In this work, made of glass, brass, and wood, an electromagnet regulated by a photoelectric sensor permits the maintenance of small metallic objects in space. If the object begins to fall, the photo sensor will receive more light and with the aid of an amplifier the magnetic force upon the object is increased, levitating it again to a point of equilibrium. Under these conditions it would be possible to speculate about the construction of objects that are free of the spatial and physical parameters that orient us, such as "above" and "below". The form of these objects can be free from the limits of mass and weight, creating new principles of construction and distribution of material. Free from the pull of gravity, said objects can assume the strangest and most imaginative configurations, approaching the old historical dream of liberating the sculpture from its base.